A Ponzi scheme is a fraudulent investment operation that pays returns to its investors from their own money or the money paid by subsequent investors, rather than from profit earned by the individual or organization running the operation. Today, Modern Cities highlights the life of the early 20th century's most notorious swindler, the guy that gave the Ponzi scheme its name: Jacksonville's one-time sign-painter Charles Ponzi. Carlo Pietro Giovanni Guglielmo Tebaldo Ponzi was born on March 3, 1882 in Parma, Italy. In 1903, having gambled away most of his life savings during his voyage to America, he arrived in Boston with $2.50 in cash and $1 million in hopes. He spent his first few years in the country working small jobs around the East Coast including being sign painter in Florida. "Once, when I was in Florida, I got it into my head that I could make something painting signs. So I bought some cardboard and paint and started in. No, I never had the slightest experience, but I got away with it, satisfied folks, and made a little cash. And all the time I kept dreaming of the time I was going to do big things." He eventually was hired as a dishwasher and worked his way up to waiter before being fired for shortchanging customers and theft. After moving to Montreal in 1907, he became an assistant teller in Luigi “Louis” Zarossi’s Banco Zarossi. Soon, the bank failed and Zarossi ran off to Mexico with most of the bank’s money, leaving Ponzi behind. After Zarossi’s departure, while visiting the empty offices of Canadian Warehousing (a Banco Zarossi client) he wrote himself a check for $423.58 and forged the signature of the company’s director Damien Fournier. Arrested for this act, he spent three years in prison before being released in 1911 and returning to America. Back in America, Ponzi ended up spending two more years in an Atlanta Prison for smuggling illegal Italian immigrants across the border. While in prison, he met another prisoner, Charles W. Morse, who became his role model. Morse, a wealthy Wall Street businessman, was released from prison by fooling doctors during medical exams by poisoning himself with toxins, such as eating soap shavings, that left his body as soon as doctors finished their visits. 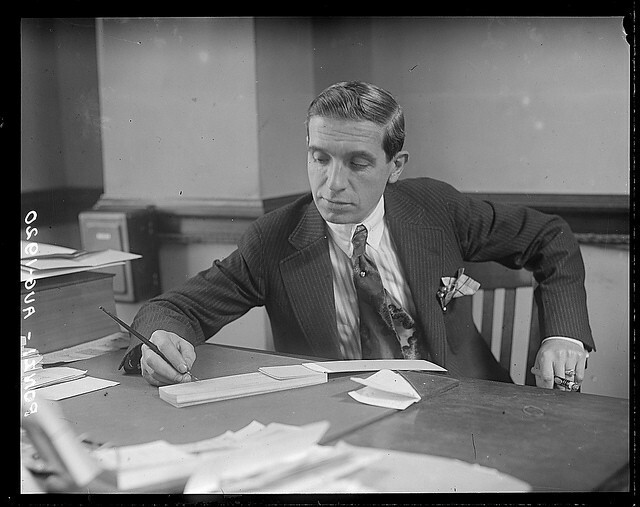 Charles Ponzi in 1920. Image courtesy of Boston Public Library. After Ponzi’s release, he relocated to Boston where he met Rose Maria Gnecco on a streetcar in 1917. A few months later, the couple married in February 1918. A couple of years later, he received a letter from a Spanish company that included an international reply coupon (IRC) inside. He then discovered a weakness in the system that would allow him to make money. Purchased in a Spanish post office for 30 centavos, it could be exchanged for a U.S. postage stamp worth 5 cents, a redemption rate that was fixed by international treaty. But the Spanish peseta, Ponzi knew, had fallen recently in relation to the dollar. Theoretically, someone who bought a postal reply coupon in Spain could redeem it in the United States for about a 10 percent profit. Purchasing coupons in countries with weaker economies could increase that margin substantially, he reasoned. It should be possible, then, to make a financial killing by buying huge quantities of these coupons in certain overseas countries and redeeming them in countries with stronger currencies. Ponzi called his new business the Securities Exchange Company, and set out to promote his idea. Ponzi then convinced friends in Boston that he’d double their investment in 90 days if they backed his scheme and he founded the Securities Exchange Company to promote it. By February 1920, the business had generated $5,000, a little more than $61,000 today. With his initial investors being repaid in 45 days, a frenzy of interest occurred and by May 1920, the company had generated $420,000 ($4.53 million in 2010 dollars). By June 1920, he had made millions from people mortgaging their homes and investing their life savings in his company. Unknown to them, the returns being paid to initial investors were a portion of the funds being invested by new investors. When a Boston financial writer suggested Ponzi’s business was doing something illegal to generate high returns in short time periods, he sued for libel and won $500,000 in damages. However, the end was near. In July 1920, the Post began a series of articles questioning Ponzi’s business. It was exposed that while his company offered impressive returns on investments, Ponzi was not investing his own money with the company. It was also revealed that to cover investments made to his business, 160 million postal reply coupons would need to be in circulation. However, at that time only 27,000 were. When panic ensued, he paid $2 million in three days to investors asking out. During this event, he also canvassed the crowd with coffee and donuts, subduing the fears of many investors fears who then left their cash in his company. On August 2, 1920, an article by his former publicity agent, William McMasters, was released which suggested that Ponzi was robbing Peter to pay Paul. On August 11, 1920, the Post published a story about his criminal history in Montreal. The next day, Ponzi surrendered to authorities and was charged with mail fraud for sending letters to his marks telling them their notes had matured. The resulting downfall of his Securities Exchange Company brought down six banks and wiped out his 10,000 investors with $20 million in loses (over $260 million today). At the urging of his wife, Ponzi pleaded guilty on November 1, 1920 and was sentenced to five years in federal prison. 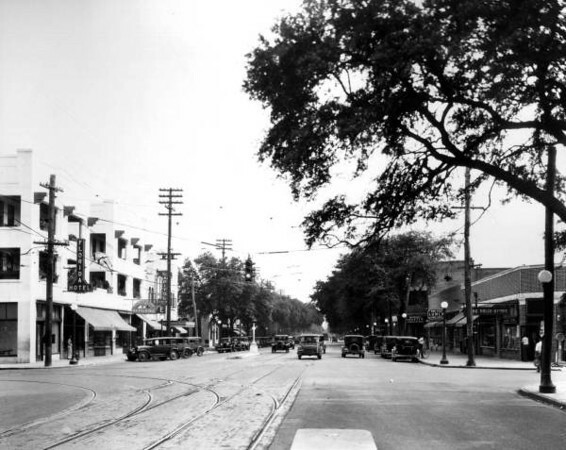 The intersection of Springfield's 8th & Main Streets, during Charles Ponzi's time in Jacksonville. Ponzi and wife Rosa Marie, resided five blocks south (background of image) of this traffic signal. State Archives of Florida, Florida Memory. Shortly after his release in November 1924, he was indicted on 22 charges of larceny by the State of Massachusetts and sentenced to an additional 7-9 years as “a common and notorious thief.” During an appeal of the state conviction, he was released on bail and fled the state with his eyes on Florida. During his stay in federal prison, Florida had become a real estate money making dream for speculators. In Miami alone, land values had increased 560% between 1921 and 1926. Looking to make quick cash, under the alias of Charles Borelli, he and his wife arrived in Jacksonville on September 28, 1925, residing on the 1300 block of Main Street in Springfield. 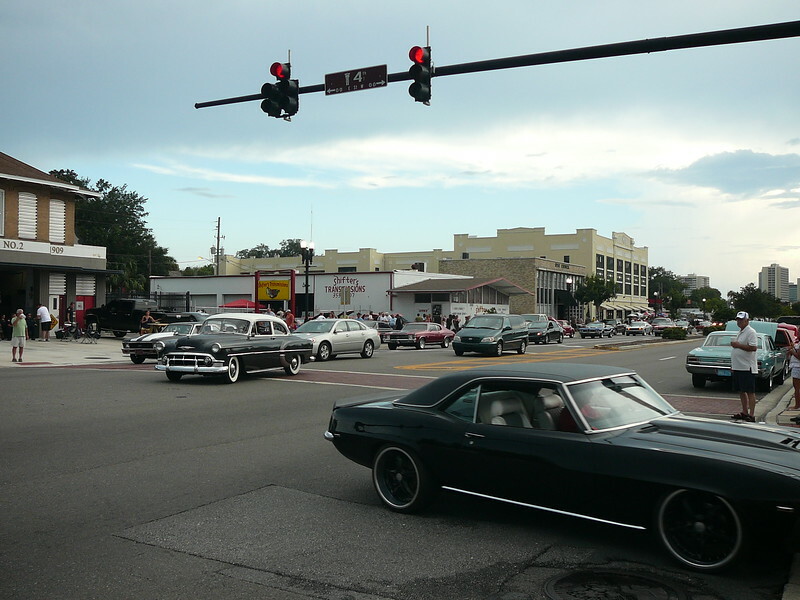 At the time, Jacksonville was rapidly growing and had recently become Florida’s first city with a population exceeding 100,000. The Borelli alias would not last long because his ego could not stand the anonymity. With his true identity known, he then announced plans to recoup his fortune through the subdivision of real estate to repay all investors from his previous scheme. With his wife and Mr. and Mrs. Calcadonio Alviati, he opened the Charpon (“CHAR”-les “PON”-zi) Land Syndicate. Advertising nationally, Charpon Land Syndicate would sell of lots near Jacksonville at an affordable cost of $10 each. Charpon Land Syndicate’s strategy was based on a plan to sell ten million small lots of property around rapidly growing Jacksonville. Financed by a few remaining friends, Ponzi’s Jacksonville scheme began with him acquiring 100 acres of land, much of it being underwater, at $16 an acre with a goal of subdividing each acre into 23 lots, which would be sold for $10 dollars each. While he advertised the property as being near Jacksonville, it was actually 65 miles west in rural Columbia County. Under this scenario, Ponzi would profit 500% off his initial investment. In addition, he would sell shares in his company to investors focused more on profits than land. To lure investors, he offered a 200% profit within 60 days, which was significantly greater than his infamous Securities Exchange Company returns. His syndicate purchased, at $16 an acre, 100 acres of land in Columbia County. It had been designated the Rosa Maria tract. Each acre would be subdivided into 23 lots. With a $10 price per lot, Ponzi would yield $214 profit per acre. Ponzi claimed that under his pyramiding plan, an initial $10 investment would yield $5,300,000 in two years. And, of course, pictures of the land revealed that some of the lots were under water. He named his first acquired tract, the Rose Maria, after his wife. Soon, two additional tracts were acquired and named in honor of his parents, Oreste and Imelde. He made his first sale on November 9, 1925, six weeks after arriving in Jacksonville. Ponzi had already collected $7,000 from investors by the time Florida officials shut down his company and issued a warrant for his arrest for failing to file proper papers and selling certificates of indebtedness without permission. In February 1926, he was indicted by a Duval County grand jury, charged with violating Florida trust and securities laws and sentenced to a year of hard labor at the Florida State Penitentiary in Raiford on April 26, 1926. 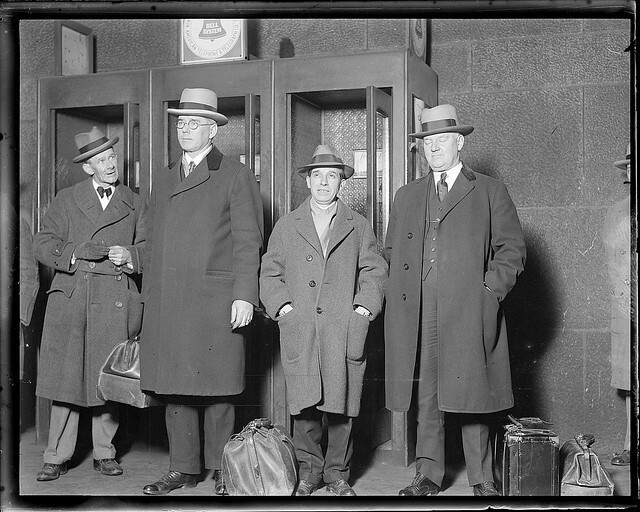 Charles Ponzi (the short guy) after his arrest in Texas after trying to jump to Italy. He is being escorted back to Boston for stay in state prison. Courtesy of the Leslie Jones Collection at the Boston Public Library. After posting a $1,500 bond and appealing his conviction, seeking to avoid a return to prison, Ponzi disappeared from Duval County in June 1926. With a nationwide manhunt for him underway, he made it to Tampa and under the alias of Andrea Luciana, he signed aboard as a waiter and dishwasher on the Italian freighter, “Sic Vos Non Vobis”. Bound for Italy, the 45 year old, 5’2” Ponzi had disguised himself by growing a mustache and shaving his head. In addition, as a part of his getaway plan, he faked his suicide by having Jacksonville friends place some of his clothing at the beach with a note apologizing to his wife and mother for taking his life. Unfortunately, for Ponzi, he made the mistake of revealing his true identity to a shipmate and word spread that the infamous Charles Ponzi was onboard. Before the ship left U.S. territorial waters, he was arrested by authorities at a port call in New Orleans, LA. In hopes of not spending more time in American prisons, Ponzi pleaded to President Calvin Coolidge proposing his own deportation instead of prison time. Ignored by Coolidge, he then appealed to Italian dictator Benito Mussolini, who also ignored him, and in February 1927, he was returned to Boston to begin his sentence in the Massachusetts State Prison. It was said that this was one of the few things Coolidge and Mussolini ever agreed on. 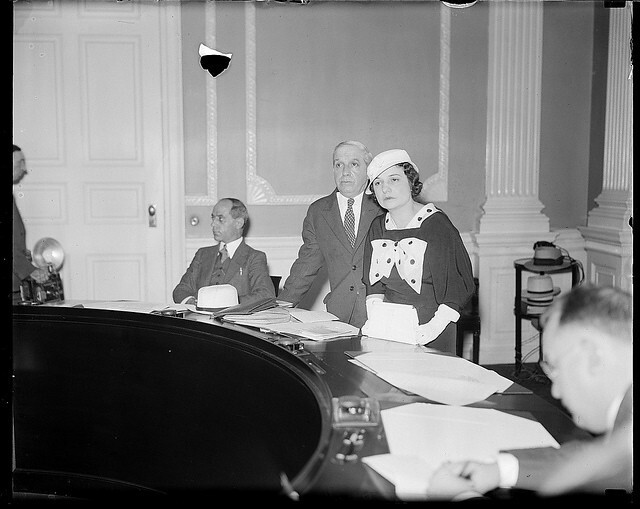 Charles and Rose Ponzi at 1934 deportation trial. Courtesy of the Leslie Jones Collection at the Boston Public Library. In Brazil, his health suffered with a heart attack in 1941 and a paralyzing brain hemorrhage in 1948. At the age of 66, Charles Ponzi died on January 18, 1949 at the Hospital Sao Francisco de Assis of Federal University of Rio de Janeiro. The 1300 block of Main Street in 2013. Charles Ponzi resided on this block in 1926 while operating the Charpon Land Syndicate and on the run from Massachusetts authorities. Handbook of Frauds, Scams, and Swindles: Failures of Ethics in Leadership By David M. Currie, Ph.D.